After what all happened in the palace the Maid Chae Ryung incident, the reality of Wook and other conspiracies happened. The King was totally fed up he came back to his quarters and happy to see Hae Soo there wearing the same make she wear at Exorcism rite night. He called over Hae Soo saying you are not angry any longer but Hae Soo wearing the mask give us a bit off feeling my sister doubted may be its Yeon Hwa, it might not be Hae soo. But we wonder how can the great Yeon Hwa wear the lowly court lady Hae Soo's mask and sitting there. May be she is up to something. May be in that disguise she would attempt King Wang Soo murder. It was the palace and there sure were many secrets and people change their mind and sides with the blink of an eye. King Wang So happily came to Hae Soo he grabbed her arm and pull her over him. Now she was in his arms and can feel how manly he is. King Wang So was now in the total romance mood. He just took half of the mask and was about to have a kiss and then he feel the strange gaze behind the mask. He was alert and didn't lose his guards. It was Yeon hwa as my sister predicted seeing her there it makes King angry. He just let go Yeon Hwa of his arms mean its another time he rejected being close to Yeon Hwa. It was the biggest insult that a women who has the label of the Queen being rejected by the king. King tone was totally changed he scold Yeon hwa that what is she doing here and what's the meaning wearing the mask. 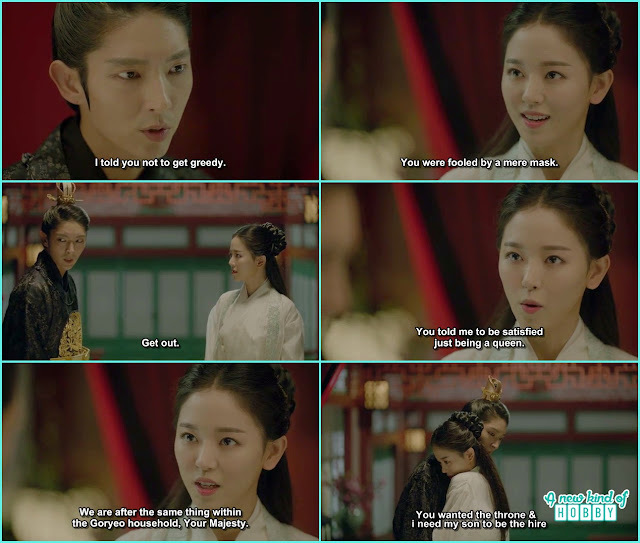 Yeon Hwa didn't show her feelings as being ignored and rejected but she taunt King that he was fooled by a mere mask. Again it was Yeon Hwa's mistake to make the king angry and lose her good side. King order her to get out. But she was persistence she argued saying that she was ordered to act like a Queen so the king should make the proper deal by letting her act properly. It wasn't the end she again pursued king that they are both after the same throne within the Goreyo household. He had to protect the throne for that he needed the son and as she is the Queen she wanted to become the mother Queen. Yeon Hwa was sure too bold and brave but still a mere women who wanted to be acknowledge by the king. It was the chance for the king he made a deal what if he can provide Yeon Hwa what she want. Will she going to turn her back on Wook and her mother? This surprised Yeon Hwa for the moment she was startled couldn't able to decide which side to choose. She decided as she wanted the throne it was the deal the King made that he will gave her the son in order she had to give up her family. We were happy that finally Yeon Hwa and Wook were trapped in their own grave.